Yes, it’s a hybrid. Toyota has unveiled its all-new TS030 Hybrid race car. It will be the first car of its kind to compete in the FIA World Endurance Championship when it makes its racing debut on May 5 at the six hours of Spa-Francorchamps. 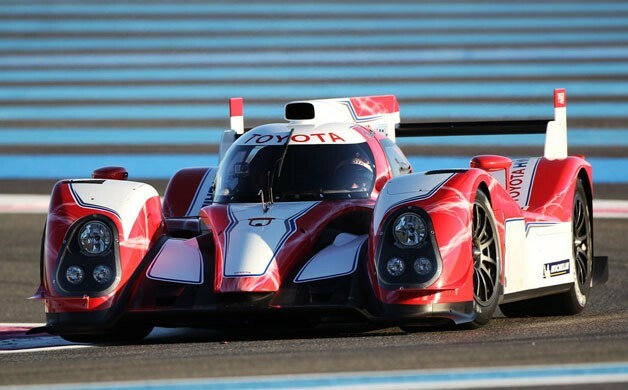 Toyota also hopes to complete head-to-head with Audi Sport’s R18 TDI at the 2012 24 Hours of Le Mans. It has been 13 years since the Japanese manufacturer last took part in the 24 hour race with the TS030’s predecessor the TS020, also known as the Toyota GT-One. Since Toyota’s decision to forgo the 2000 race Audi has dominated the top LMP1 ((Le Mans Prototype 1) class winning 10 of the last 12 races. Powering the TS030 is a 3.4-liter, naturally aspirated V8 gasoline engine with a hybrid system consisting of capacitor storage areas at the front and rear of the vehicle. The hybrid system allows the vehicle to recoup lost power during braking. However, current racing regulations limit the amount of power stored to 500 kJ (kilojoules). The chassis is comprised of carbon-fiber and was developed by Toyota Motorsport GmbH (TMG). Ironically, on the same day Toyota annouced their return for this year’s race, Audi’s recent rival Peugeot has suddenly and unexpectedly withdrawn their 908 LMP1 prototype, which defeated the Audi R15 TDI in 2009 at Le Mans. Without Toyota’s entry the race for the overall crown would have been a foregone conclusion, as Audi would have been the only serious contender in the class. Alex Wurz, Nicolas Lapierre and Kazuki Nakajima have been chosen to pilot one of the two prototypes, but the line-up for the second car has yet to be determined.